Fifa president Sepp Blatter has told the BBC that the timing of the Africa Cup of Nations must be changed. 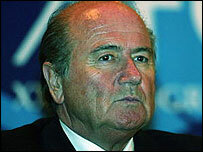 Blatter said that by 2016, the biennial tournament must be held in June and July like other major tournaments. Earlier this week, the Confederation of African Football (Caf) insisted that the competition will continue to kick off in January. There have been frequent complaints from European clubs who lose key players to the tournament. "This is a tradition, but one should have now the courage to go into the international calendar and see if it's not possible to deal with it," said Blatter. "We put a target for 2016 that by that time the international calendar must be definitely in accordance with the interests of everybody." Who do you think will win in Ghana? Around 40 African players in the English Premier League will be in Ghana for the Nations Cup. Caf has maintained that the June weather in much of Africa is not ideal for football. There would also be the problem of a clash with the World Cup every four years, but Blatter suggested that the Nations Cup could be moved to odd years.